Buy Hazel Hedging (Corylus avellana) online from UK tree supplier of cell grown broadleaf hedges and shrubs. 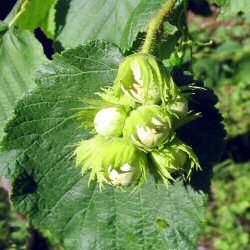 Hazel (Corylus avellan) is a fast-growing, naitve, Britisn hedging species, recognisable by its long yellow catkins and edible Haezelnuts during Autumn. Commonly, planted as a mixed native hedge, alongside, Hawthorn , Blackthorn, Dog Rose , Elder and Crab Apple , there is no reason why Hazel could not be planted on its own. Our Hazel hedging trees are sold as plug plants, in other words the roots are encased in compost. This means that planting can be carried out at any time of the year, provided they are watered in periods of drought, compared to bare-root plants which can only be planted during the plants normal dormant period (November to March). All of these trees are UK grown, which is important for successful establishment. How many Hazel hedging trees do I need?